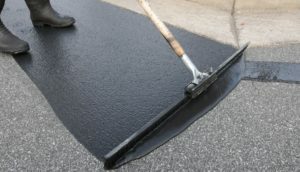 Sealing your driveway is a crucial component of offering protection for your driveway. The seasonal conditions in Connecticut can often create a great deal of stress and damage to your driveway, as well as the wear and tear from foot and automobile traffic. These factors will comprise the integrity of your pavement causing it weaken and crack over time. With driveway sealing services from Sealcoating Solutions of Southbury, you can offer protection and prevent much of this damage from occurring. Our commercial and residential driveway sealcoating services will effectively seal your driveway, creating a greater level of resiliency and making it far less susceptible to damages. Our comprehensive sealing services will work to prevent water from seeping into cracks in your driveway, which will not only damage the visible areas of your driveway, but also the foundation. Additionally, a sealed driveway requires less work to maintain and clean, so not only will your pavement stand the test of time, but it will also be much more aesthetically appealing. Hot Crack Filling is one the more popular services that we offer. If you have noticed cracks beginning to appear on the surface of your pavement, it is imperative that measures be taken to repair the issue. If the problem is ignored, the cracks will can potentially become larger and cause additional cracks to appear, which will lead to a much more expensive repair or replacement project in the future. 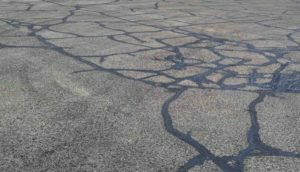 Sealcaoting Solutions asphalt repair services and hot crack filling are effective in repairing damaged asphalt because it bonds and adheres to the pavement, due to the high temperature and the application methods. Our asphalt repair services are effective in preventing water from penetrating the crack and damaging the base material beneath the pavement. Southbury Sealcoating Solutions are licensed and insured, and are capable of handling commercial sealcoating projects of all size and scope. We offer a 100% satisfaction assurance to each of our clients, which makes us the the trusted option for commercial property managers and owners who are interested in enhancing the overall look, as well as protecting their asphalt property investment. 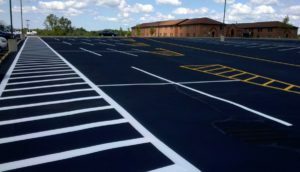 We offer customized ongoing maintenance programs that will increase the beautify and give your asphalt pavement full protection, which can be a cost-effective alternative to overlaying new asphalt. Our commercial asphalt sealcoating services will prevent your parking areas and walkways from damages due to seasonal elements, cracks, ongoing wear and tear, toxic spills, and oxidation, to name a few. Our comprehensive asphalt maintenance program that involves the necessary sealcoating and crack filling services, that will protect your investment drastically increase the lifespan our your asphalt pavement.